Copyright © 2014 Genoveva Millán et al. This is an open access article distributed under the Creative Commons Attribution License, which permits unrestricted use, distribution, and reproduction in any medium, provided the original work is properly cited. In accordance of the Creative Commons Attribution License all Copyrights © 2014 are reserved for SCIRP and the owner of the intellectual property Genoveva Millán et al. All Copyright © 2014 are guarded by law and by SCIRP as a guardian. Spain is the leading producer of olive oil. For Spain, olive oil and olive growing are not only an important source of economic wealth, but also symbols of its culture and gastronomy renowned both nationally and internationally. However, in rural areas where the olive is the primary source of income for resident families, proposals are being sought for activities that break away from the seasonality in income represented by dependence on agriculture. Among all these proposals there is one, that of oleotourism, that is beginning to gain ground because of its facet of culinary tourism. This is due to its uniqueness, and it can also be considered an initiative for sustainable rural tourism. Given the interest aroused by this type of initiative, both on the part of the public administration and also the olive sector, this study involves the demand for oleotourism in Andalucía and is a strategic analysis of oleotourism as a new market sector in the south of Spain. Olive is a traditional Spanish agri-food export and a symbol of its rich cuisine. In fact, Spain is the world’s largest producer of olive oil with an average of 1,297,841 tons in the last campaigns, which represents 60% of world production, and with exports of 700,000 tons which makes it the world’s largest exporter, exporting to over 100 countries on five continents and whose estimated net worth amounts to 3000 million euros [1,2]. Andalucía, a region geographically in southern Spain, produces 80% of the oil in Spain. The Andalucían region dedicates more than 1.5 million hectares to olive cultivation, which represent more than 43% of its cultivated area, 60.15% of the olives grown in Spain and 35% of the entire European Union (Table 1). Also, the olive is a crop of great social importance in Andalucía. For many Andalucían regions, olive groves are the only source of direct and indirect income for the population, and the main economic activity in over 300 municipalities in Andalucía . It is precisely that heavy reliance on olive growing in many municipalities in Andalucía that provokes great feelings of uncertainty in families regarding their income because neither the quantity nor the quality of annual production can be foreseen with precision. This uncertainty is due to such uncontrollable elements as the weather which play a key role in agricultural production [4,5]. The effects of these uncontrollable factors are exacerbated by the seasonality of olive production, concentrated into a few months of labour and involving the income of an entire year. Thus, for example, in Spain the production of olive oil in 2012 decreased by more than 41% from the 1599 thousand tons in 2011 to 657.3 thousand tons in 2012. 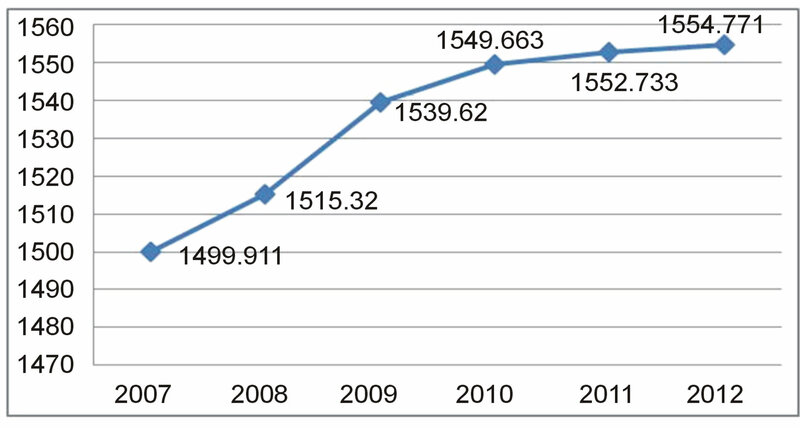 In Andalucía the decline was somewhat less: 38.3% from the 1353.8 million tons in 2011 to the 519.3 thousand tons in 2012 (Figure 1), although the area devoted to this crop increased slightly during this period (Figure 2). Table 1. Olive surface distribution by Autonomous Region (Spain) 2012. Figure 1. Evolution of olive production in Andalucía (thousands of tons). Source: compiled by the authors based on the Agricultural Statistics Yearbook. Figure 2. Evolution of the olive production surface in Andalucía (thousands of hectares). Source: compiled from the Spanish Survey on Surfaces and Crop Yields (ESYRCE). olive groves, which all combine into an excellent untapped tourism product (oleotourism) based on the raw material of an olive oil that is well-known internationally not only for its organoleptic characteristics but for its use in the Mediterranean diet. This study is not a call to make tourism the main source of income in rural areas, but rather to get additional revenue for local inhabitants. It seeks to promote sustainable rural tourism and gastronomy, with the practice of eco-activities, to generate wealth and employment over time, maintaining and preserving the environment and industrial heritage, using factories (mills, warehouses, etc.) located in rural areas that can be visited. Tourist activity will not negate the farm but will instead help reduce regional imbalances in the area. Oleotourism is a form of domestic tourism (especially in rural areas) related to gastronomy, which allows the essence of the culture encompassing the world of the olive to be captured while deepening knowledge about everything connected to olive oil: food, accommodation in typical architecture integrated into the orchards, beauty and health treatments, relaxation, etc. Visits to mills, oil tastings, mill breakfasts, guided tours and the leveraging of local resources associated with the production of olive oil are some of the services that can be offered to tourists. Concrete measures are needed to support both the tourism and olive sectors, in order to achieve a symbiosis between gastronomical and tourism products, thus leading to the socio-economic development of olive-growing areas. Olive oil tourism can be considered as an economic agent which has a set of characteristics or qualities that characterise it as being a bit out of the ordinary. Tourism based on quality agricultural products in rural areas can be a stimulus for the economy to prevent migration to other areas as a result of high unemployment rates in these developing areas. National and supranational associations have been created to spread the culture of the olive tree. They aim to reconsider the olive as a tourism resource that generates cultural, heritage and gastronomical landmarks, thus providing impetus for more economic development in the municipalities that make a living from this ancient crop. Examples of these associations are the Spanish Association of Olive Municipalities (AEMO) or European Red Olive Municipalities (REMO). 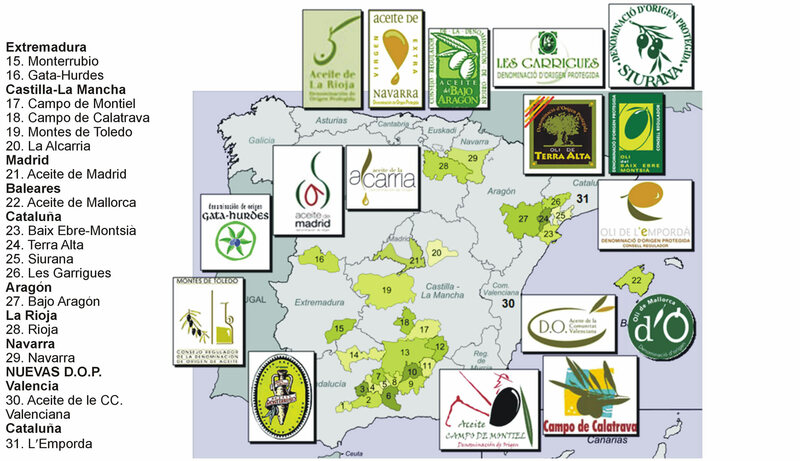 The Spanish Association of Olive Municipalities (AEMO, created in 1996 in Baeza (Jaén), is meant to provide a knowledge platform from local government to promote and enhance the “Olive Culture” as the core element articulating and characterizing the distinctive personality of certain communities: their economy, landscape, urbanism, environment, culture, labor market, history, etc. Since it began, it has developed several projects, such as the creation of a network of olive museums, the creation of organizations to spread and promote olive culture, the organization of technical, cultural and gastronomical events, and others for tourist development, courses, exhibitions, seminars… all related to Olive Culture. As stated in the document by the European Forum of Olive Regions at its meeting in Brussels on March 7, 2012: “The olive grove contributes to areas of great environmental and scenic value, representing also a key element in generating employment and income in the rural areas where it is found; at the same time it is an essential element in the cultural heritage of Mediterranean regions” . That is why the development of tourism activities anchored in the olive world must have the characteristics associated with sustainable rural tourism, as they should harmonize with the interests of the activity itself, the environment and local community, managing ecological, socio-cultural and economic elements as well as possible and in a compatible way [7-10]. This activity helps to break with the traditional seasonality typical of this sector, which is crucial from an economic standpoint. Tourism in rural areas is done more regularly throughout the year: weekends, holiday weekends, Christmas holidays, etc. It is also less dependent on the weather being experienced. For this reason, the employment created does not have to be as temporary as most of what is created by sun and beach tourism, predominant in Andalucía. The development of tourism activities in rural areas is rather risky, since those spaces usually have a great ecological, scenic and cultural heritage. Moreover, this activity implies activating some risk factors for this territorial zone of reference (land use, development of infrastructures, emissions and discharges of different substances, etc.). Therefore, tourist activity that takes place in a rural environment must be properly planned and managed  to avoid any negative environmental, cultural or social impacts. This requires the adoption of a long-term approach (strategic planning) and taking into account the many ways in which tourism and the environment can be interrelated, thus avoiding situations in which these activities or facilities could overwhelm the capacity of the area, thereby adversely affecting the demand itself as a result of environmental degradation and/ or the culture of the territory. Certainly, unplanned and uncontrolled rural tourism could entail irreparable costs, even greater than any other traditional tourism, as it involves special physical and psychosocial penetrating forces . New trends in consumer habits have increased interest in higher quality and different products adapted to the new needs of different groups and market segments. Given this increase in consumption of different products due to their quality, one of the most valuable ways of achieving it in the agricultural environment are the geographical indicators of origin and in particular Designation of Origin (DO), which integrate in their definition not only the geographical origin but, in a relevant way, the tradition and expertise involved in producing high quality products with differentiated personalities, as well as the regulation and control mechanisms exercised in their production . These designations of origin are endorsed by a regulatory board that guarantees that companies that are part of the D.O. meet certain standards of quality in their manufactured products, and use raw material (in this case, the olive) with specific organoleptic characteristics (color, smell, and taste). In Spain there are 31 D.O. of olive oil and extra virgin olive oil, 14 located in Andalucía, where the economic value of the products of D.O. olive oil were 62.21 million euros in 2012 (only one-fifth of the production of olive oil is marketed under the quality standards of the D.O. ), representing 8.2% of the economic value of agricultural products covered under the designations of origin in Spain, whereas it is the D.O. of cheese that represents the highest percentage at 23.25%. Figure 1 shows the geographical location of the D.O. in Spain. An additional way to publicize oil as a gastronomic product is to market it as a tourism product, protected by an appellation of origin that creates a tourist route where you can learn about the quality of oil, its production process and its taste. The oil route concept consists in forming certain rural destinations with a clear focus on cultural and rural tourism, an integrated product based on the olive, dining and cultural activities accompanied by a wide range of related accommodation services (mills, oleotecas, oil museums…) and a wide range of complementary activities: golf, equestrian, commercial, restaurants, nightlife, etc. The oil route is not, however, a mere show of road signs, but also safe timetables for visitors, the ability to manage and show off one’s own company, knowing how to welcome a tourist and make him feel at home, structural modifications of the mill, careful cleaning and sales offers… An oil route is characterized by a mixture of natural, cultural and social agents, as well as activities in the mill, local cuisine, and that contemplate the world of oil (such as museums), and the purchase of local handicrafts and typical products of the area on a route or visit through all the places and resources linked to oil and its related lifestyle, without distorting or overdoing it, giving rise to representations or simulations. The oil routes are, therefore, driving forces for tourism due to the number of agents involved: farmers, cooperatives, restaurateurs, hoteliers, salesmen, traders and local authorities who can generate wealth in the area. However, the olive oil routes in Spain and especially in Andalucía are not as well-known or visited by tourists as those pertaining to wine, and calls are being made to strengthen these and help them to grow by complementing them with other food products such as wine, ham, etc. (Figure 3). Adapting a mill so it can be visited involves a cost for the entrepreneur, as he has to invest in infrastructure (the mill must meet certain safety standards) and personnel (the training of staff to attend to tourists and learn about production techniques and the characteristics of processed oil). Therefore it is necessary to know what the estimated demand of oleotourists could be to see if the investment will render a profit. The demand for Oleotourism in Andalucía is a variable with a trend of variance which has been corrected by the Box-Cox transformation of λ = 0.2 and average trend and cycle that have been corrected with a differentiation in average and in cycle. This gives us the estimated model for forecasting monthly oleotourist demand in Andalucía. Table 2. Results for ARIMA. Figure 3. Geographic situation of the protected denominations of origin of olive oil in Spain. Source: Compiled from information provided by the Ministry of Agriculture, Food and the Environment (http://www.magrama.gob.es/es/alimentacion/temas/calidad-agroalimentaria/calidad-diferenciada/dop, consulted 29-11-2013). Community’s wine tourism which exceeds 600,000 tourists, or tourism in general, over 8 million people a year. The months where demand for oleotourism is very low would be in August with just over 4200 visitors and July with 4400. Based on the results obtained, it is necessary to perform an analysis of strategies to promote oleotourism. As Oleotourism has great potential for development in Andalucía, it is necessary to analyze the strategies that the tourism sector could put into practice in the community to analyze what needs to be improved to convert olive oil, of which Spain is a world leader in production and quality, into a benchmark for culinary tourism. The promotional strategies of any tourism product undoubtedly require knowledge of the characteristics, circumstances, preferences and needs of the market, both from the point of view of supply and that of demand. The area must adapt itself by diversifying tourism products, and obtain a specialized supply to meet the needs of changes taking place in consumer habits, which is ultimately a priority when it comes to loyalty and attracting new tourism consumers. The strategies and measures suggested will allow the promotion of the area, increasing wealth and attracting new investment. 1) Strategy: Encourage the coordination of public and private institutions to promote culinary tourism. This requires promoting coordination among the various municipalities to cooperate in the joint distribution of the activities of various institutions: publishing a catalogue, a website, etc. Meetings between public and private entities should also be promoted to coordinate the actions to be carried out to develop oleotourism in Andalucía. a) Developing tourism cooperation with other activities to design an integrated offering aimed at reducing the seasonality of demand. b) Promoting joint tourism promotion with other companies whose activities are related to tourism. c) Encouraging and supporting associative participation in certain leisure-oriented events. a) Developing the expertise of a professional training center and offering practice training in businesses in the sector. b) Promoting the implementation of technician certifications dedicated to specialization in different activities in the area. c) Promoting the development of studies in hospitality and tourism oriented towards qualification requirements for various activities in these sectors. a) Fomenting instruments to identify quality olive oil products. b) Foment instruments to associate ideas relating the quality of services/quality of life and the image of rural Andalucía. a) Promoting and supporting legal measures aimed at curbing the impact of underground economy in the area, as is the case of illegal lodging in rural areas. b) Promoting adaptation to quality standards of products, services, facilities and equipment of enterprises and institutions in the area. c) Designing and enhancing communication strategies that transmits to the market an image of quality with respect to the area. d) Adopting strategic planning systems in municipalities so that they can act in coordination with each other, seeking to develop the whole region. a) Promoting specialization and flexible diversification in tourism activities, especially taking advantage of the different possibilities available during each season of the year. b) Promoting the direct sale of olive oil products, differentiating each one’s natural quality and doing so in conjunction with other activities. • Traditional landscapes: olive orchards, mills, visitor centers, oil tastings. • Harvest program: This is a tour of the olive orchards in the company of an agronomist, including oil tasting. • Pruning program: It is a full day activity in the company of an agronomist, and offers oil tastings. • Courses on local cuisine with dishes prepared using the characteristic products of the area where the courses are offered. The adoption of measures to improve the image of the area, promoting participatory tourism where visitors can join in and help out in chores and customs and local ways of life, and rescuing traditional activities all differentiate the product and services offered in an area from other competing destinations. Offering oil tourism (the symbiosis between commercial production and tourism linking different agents including farmers, restaurateurs, hoteliers, etc.) becomes the force that will add value to a new use for oil, tourism. But certainly the most important thing is to coordinate and plan any activity and tourism initiative that could flourish and create economic prosperity in the area. To do so, it is essential to establish the environment of the place as a tourist attraction, and promote stable and sustainable development while increasing local inhabitants’ degrees of involvement with tourism. Andalucía, the region that geographically occupies southern Spain, dedicates over 1.5 million hectares to the olive, accounting for 35% of the olives cultivated throughout the European Union. Also, the olive is a crop of great social importance in Andalucía. For many regions, Andalucían olive groves are the only source of direct and indirect revenues for the population, and comprise the main economic activity in more than 300 municipalities in Andalucía. Precisely that heavy reliance on olive growing of so many municipalities in Andalucía provokes strong levels of uncertainty in families regarding their income because the quantity and quality of annual production are never really foreseeable. To cope with drops in production and, therefore, in the income of people engaged in agriculture, a complementary activity can be generated taking advantage of the culturing of olives: using olive pressing mills as a tourist attraction, and forests of millennial olive trees and olive groves that combine an excellent untapped tourism product (oleotourism) and based on raw olive oil which is internationally well-known not only for its organoleptic characteristics but also for its use in the Mediterranean diet. One way to develop oleotourism is to market it, protected by a designation of origin that creates a tourist route that informs about the quality of the oil and its production process, and provides oil tastings. However, creating a tourist route does not only consist of setting up signposts; it requires a major investment effort on the part of mills to adapt facilities originally designed for industrial use into ones for tourism use as well. The adoption of measures to improve the image of the area, promote participatory tourism where visitors can join in and participate in tasks, customs, and the local way of life, and rescue traditional activities all give the product and service offered by the zone a degree of differentiation from other competing destination areas. Offering oil tourism as a symbiosis between production, marketing and tourism, and uniting the different agents involved (farmers, restaurateurs, hoteliers, etc. ), all creates the driving force that will add value to a new use for oil, tourism. The expected increase in demand for oleotourists next year indicates that even in times of crisis, oleotourism has fomented the existing demand for learning, which is an opportunity that rural olive zones in Andalucia should not bypass. However, to develop tourism in olive-growing areas, it is necessary to establish a number of strategies (promotion, cooperation, investment, etc.). To allow the investments made to generate a booming economic prosperity in the area, it is essential to transform the environment of the place into a tourist attraction and promote stable and sustainable development while increasing the commitment of the local population in tourism. International Olive Council (2012) The world market in figures. Olivae, 117, 28-34. Ruiz, I. (2011) Olive oil as a tourist resource: Conceptual boundaries. Olivae, 115, 32-47. Villalba, F., Becerra, F. and Expósito, E. (2009) Aspectos socioeconómicos del aceite de oliva en Andalucía. In Fernández, A. and Segura, A., Eds., El aceite de oliva virgen: Tesoro de Andalucía. Servicio de publicaciones de la Fundación Unicaja, Málaga, 79-105. Moschini, G. and Hennessy, D.A. (2001) Uncertainty, risk aversion, and risk management for agricultural producers. In Gardner, B.L. and Rausser, G.C., Eds., Handbook of Agricultural Economics, 1, Elsevier, 88-153. Quesada, J.M., Molina, V. and Ruiz, I. (2010) Oleoturismo en España: Potencialidad de éxito internacional en escenarios actuales. Global Conference on Business and Finance Proceedings, 5, 1534-1560. Junta de Andalucía (2012) Documento del foro Europeo de las regiones olivareras. Consejería de Agricultura y Pesca. Lane, B. (2005) Sustainable rural tourism strategies: A tool for development and conservation. Interamerican Journal of Environment and Tourism, 1, 12-18. Bramwell, B. and Lane, B. (1993) Sustainable tourism: An evolving global approach. Journal of Sustainable Tourism, 1, 1-5. Dower, M. (2003) Developing sustainable rural tourism. Thematic guide one. European Summer Academy for Sustainable Rural Development, Athens. Crosby, A. (1994) Interpretación ambiental y turismo rural. Centro Europeo de Formación Ambiental y Turismo, Madrid. Márquez, A.M. and Hernández, M.J. (2001) Cooperación y sociedades cooperativas: El caso de la Denominación de Origen Sierra Mágina. Revista de Estudios Cooperativos, Revesco, 74, 123-149.